Dog injuries from escalators are on the rise in the Bay Area, but the SFSPCA reports that such incidents can easily be avoided. Some humans want to take their dogs everywhere they go — public transportation, restaurants, even the mall — especially with an expanding roster of places going pet-friendly. But according to the San Francisco Society for the Prevention of Cruelty to Animals, dog owners should avoid taking their pooch on escalators. “Every month we see far too many escalator-related emergencies,” Dr. Jennifer Scarlett, DVM and co-president of the SF SPCA, said in a statement. Injuries range from torn toenails to lost toes and worse. In one instance, the SFSPCA treated a pooch who had almost half his paw torn away (vets saved the appendage, but three toes were lost). It isn’t just digitals that are at risk, either: long-haired dogs could potentially get their fur or other accessories caught in the machinery. Moving walkways pose a similar hazard. 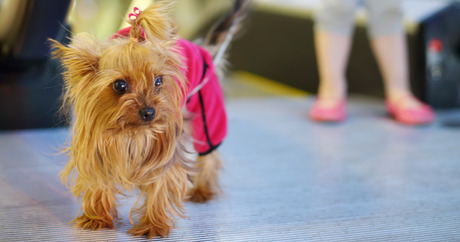 Dog owners are urged to use stairs or an elevator as an alternative, but for those who must ride an escalator with their dogs, carry the animal or fit them with a pair of dog boots. According to the San Francisco Examiner, cases of dog escalator-related injuries are on the rise in the Bay Area, with surgery costing as much as $4,000.